How Did They Squeeze a Camera Into This Tiny RC Helicopter? 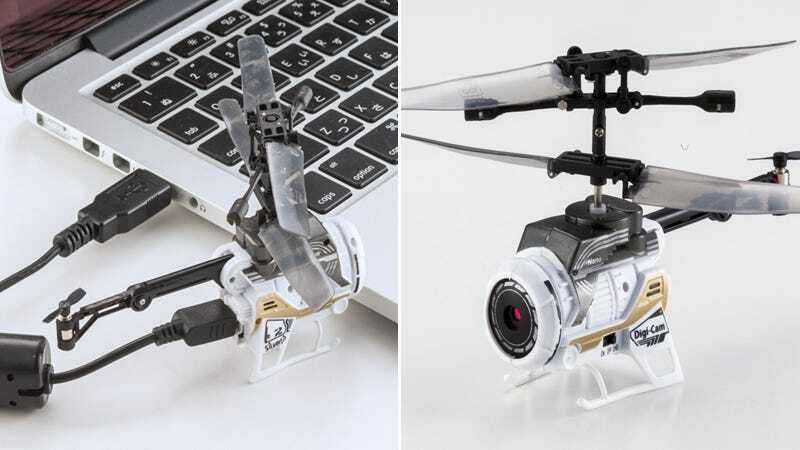 We’ve been flying tiny helicopters around our living rooms for years now, but Silverlit, the company who created the world’s smallest flying toy, has somehow found a way to squeeze a video camera into its miniature RC choppers now. The NanoFalcon DigiCam features a double-rotor design to keep it from spinning out of control while in flight, while a tail rotor tilts the whole craft slightly forward so that it can be piloted around a room instead of just hovering in one place. Its built-in camera captures stills or video to an on-board microSD card, but not surprisingly, its image resolution is limited to VGA quality—just 640x480—in both instances. However, it’s still impressive that a flying RC toy this small can capture anything at all. The included controller, packed with four AA batteries, is also used to charge the helicopter. And after being docked for about 35 minutes the NanoFalcon DigiCam has enough power for around just four minutes worth of flight time. So if you’re using it as a spy tool, you’re going to need to get in and get out very quickly.